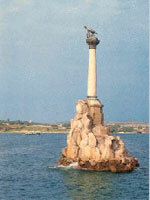 Sevastopol is a city on the South Seashore of the Crimea. Crimea is a country of striking beauty - rolling, fertile countryside, with fruit farms and vineyards in the centre give way to the forested gorges and rocky escarpments of the mountains as you travel south towards the beaches of the Black Sea. And below the Yaila Mountains is one of the most breathtakingly beautiful coastlines in the world. The Crimean coast lies on the far side of the Black Sea from Turkey. Stunning mountain scenery, warm sea and a long season of summer sunshine have made the Crimean coastline the Riviera for Ukrainians and Russians since the time of the tsars. The Russian and Ukrainian name for Crimea is Krym – pronounced like “cream”. And it really is the cream as a holiday destination. Yalta , Sevastopol , Simferopol , Sudak, Feodosia – the rich history of these Crimean cities is still alive today in its fabulous palaces and historic sites, and in the culture and way of life of Crimean people. Transport and accommodation are cheaper than the Mediterranean resorts but the weather is better and the sightseeing amazing! The Crimean people are a mix which has been determined by their history. The population of 2.5 million consists of a majority of Russians and Ukrainians, substantial numbers of Tatars, and smaller numbers of Greeks, Armenians, and Jews. When you come to Crimea, you're likely to arrive by air or train in the bustling, modern regional capital, Simferopol . This is where the Supreme Rada and Council of Ministers meet - Crimea has special status as an Autonomous Republic and can pass its own laws, while remaining subject to the national laws of the Ukraine. Simferopol is a thriving commercial centre at the heart of a farming region, with food processing, fruit canning and machine manufacturing industries. For years the town of Sevastopol was closed to foreigners even to Ukrainians who couldn't show that they had a good reason for going there. You had to have a permit, because Sevastopol was the home of the soviet Black Sea Fleet, and at the height of the cold war the town was definitely off limits to western tourists. In 1997, Russia agreed to hand over control of the town to Ukraine , and now Sevastopol welcomes visitors. The Black Sea Fleet is still there, but now you can get a boat tour of the harbor and take photos of the subs and battleships at their berths. The 1997 agreement left Russia and Ukraine with about half of the fleet each. You can go to Balaklava harbor with its maintenance bays for submarines built inside the mountain (if you're a scuba diver, one of the local centers offers a dive through the underwater tunnel into the maintenance cave, now no longer used.) Balaklava is equally famous as the base from which the British, French and Turkish allies launched their siege of Sevastopol during the Crimean War. At Khersoness point on the outskirts of Sevastopol there is one of the most important archeological sites in Crimea. The columns and portico of an early Christian church from the 4th century AD stand next to the sea among the remains of a city which was originally a Greek colony founded around 420 BC. Archeological finds are on display in the museum at the site. Even if you're not particularly interested in the archeology of the place, Khersoness is worth a visit just for the fantastic sea views. Best to go on a sunny but breezy day when the wind will bring waves bursting into spray over the low rocky shores of the headland. On a day like this the sea can be a translucent pale green, with waves whipped into white by the wind.